In 1888 Lobre achieved a degree of recognition at the Salon when he obtained an honorary mention and was awarded a travel grant. He passed some of the summer in Dieppe (Normandy) in the house where his friend the painter Jacques-Émile Blanche would spend long periods, and which from 1885 had become a meeting place for French and English artists such as Degas, Whistler and Sickert. In a pastel executed in the summer of 1885 (Providence (RI), Museum of Art, Rhode Island School of Design, no. inv. L824) Degas depicted Blanche, Sickert, Henri Gervex and other friends in Blanche's garden in Dieppe. In his book La maison d'un artiste, devoted to a description of his art collections, the novelist Edmond de Goncourt noted: "While combing my hair or cleaning my teeth, I have the peculiarity of enjoying-during these tedious operations-looking at some coloured piece of paper stuck to the wall or an iridescent ceramic tile which glows and reflects the light in the colours of the flowers. For this reason my bathroom is literally covered with pieces of porcelain and gouache drawings." A cultured artist and a collector on the level of refinement of Goncourt, Blanche would also decorate all the rooms in his homes (including the bathroom, as in the present case) with exquisite objects: paintings, rugs, the decorated fireplace which frames a vase of flowers. Next to the basin there is a William Morris chair, while on the wall one can make out a Japanese print and a small Whistlerian landscape. The mirrors allow the spectator to make out the rest of the room, creating a small and mysterious labyrinth. This painting, which dates from Lobre's best period, shows the artist's quintessential gift as an intimiste. The famous critic Félix Fénéon described the paintings which Lobre exhibited at the 1889 Salon: "In his peaceful, homely pale green interiors, with his paintings on the wall and his Louis Philippe furniture, Lobre placed a few graceful and fragile figures: here a young girl in front of the big round table where she takes coffee: there another in a pale blue dress with dark blue belt and a huge hat, a girl of precociously Whistlerian air who is about to disappear." The last reference seems to be to the present painting. The adolescent girl sums up the delicate atmosphere of the room and represents the spirit of transience, of human life as a fleeting experience. For Lobre, the fugitive is an optical experience, as in Impressionist painting, but also a vibration of the soul. 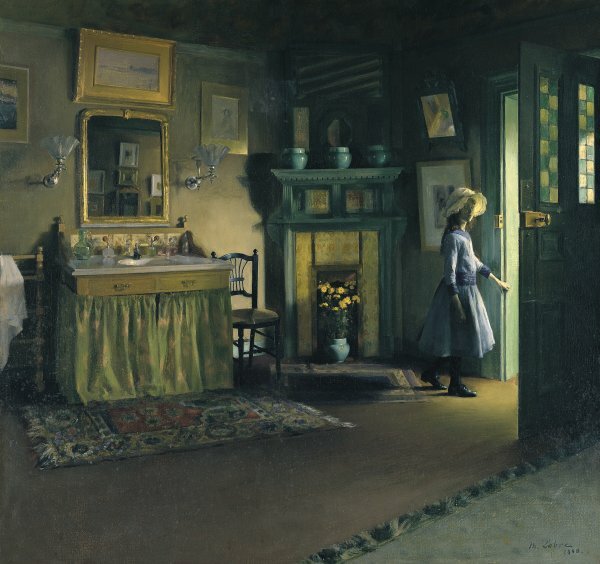 From a corner of the room the artist's gaze happens on the moment when the door opens and the light gradually reveals the treasures within, makes the surfaces gleam and creates a theatrical play of shadows. At that moment the girl turns round and looks at us with an ambiguous expression. It is but a moment: very soon she will leave the room, will close the door behind her and everything will vanish into the darkness.